As tensions rise in the escalating conflict between Israel and Hamas, anchors Wolf Blitzer and Anderson Cooper will broadcast live from the region beginning Monday. 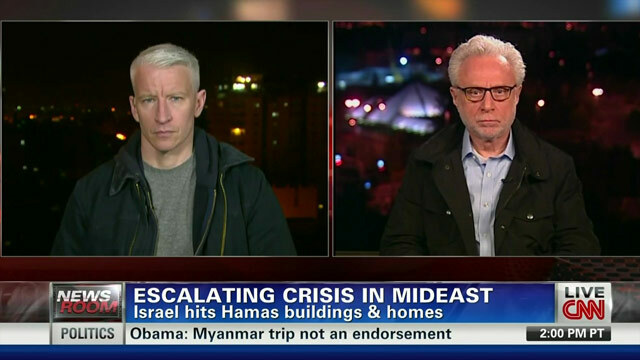 Blitzer will report live from Jerusalem while Cooper will report live from Gaza. Their programs, The Situation Room with Wolf Blitzer and Anderson Cooper 360°, will air live from their respective locations. The Situation Room with Wolf Blitzer airs weekdays 4 p.m. to 7 p.m. ET. Anderson Cooper 360° airs weekdays 8 p.m. to 9 p.m. and 10 p.m. ET. On CNN International, Amanpour airs 3 p.m. to 3:30pm and 5 p.m. to 5:30pm ET.